Last year in October, I fell down a rabbit hole at my first Australian Society of Archivists (ASA) conference, and a few weeks ago I revisited Archival Wonderland at the 2017 ASA conference, this time in Melbourne. I’ve had a week and a bit to do some ‘critical reflection’ on the conference (one of the tenets of good archival practice that the ASA suggests for members, which I also am now! ), and I’m struggling to find as glib a theme as last year’s blog. So instead I’ll take you on a bit of a journey towards where we are intending to go with the Archives as a result, with a quick stop at some frustration along the way. I thought it was a good time to reflect on why we were even at an Archives conference, considering we are an environmental technology company. 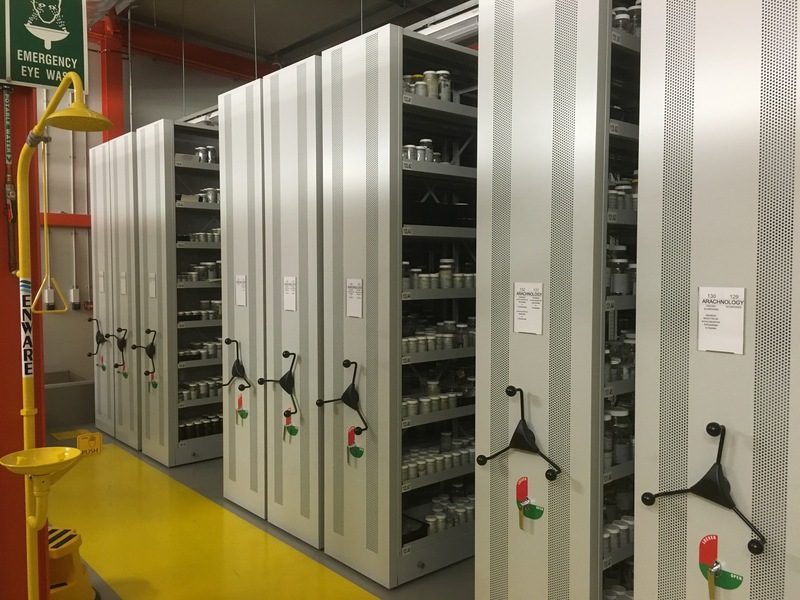 When we started working in the biodiversity data management space all those years ago, helping Museums and Herbaria manage their collections was a key part of that. They are, after all, the keepers of the names that we use in biodiversity. While on site one day at the WA Museum, I met Meg Travers, who had been seconded from the State Records Office of WA (SROWA) to help with some project work. Meg was then the Digital Archivist of the SROWA, and while we talked about Archives and Collections I began to see how the two were similar. At a very simple level, Collections manage things on shelves, and describes the context around them – and (simplistically!) so do Archives. So there was a commonality there to start with, and when I dug deeper I found that the Archives profession also did things like Digital Preservation (more than just file storage!) which would benefit the Collections area. And there are a few other things that work in the opposite direction as well – such as data standards, controlled vocabularies, and other open source software such as CollectiveAccess, which we’re looking at for other organisations. So we started learn about this Archives profession, investigated the open source options such as AtoM and Archivematica, and after a lot of hard work and research we find ourselves now working with a range of Archives around Australia. My attendance at the ASA conferences (and becoming a member) has been part of what I think is a really important investment – I think it’s irresponsible for us to offer services to an industry we don’t understand, so that’s why we are there. This different perspective on Archives – from a little bit “outside” of it – is something I was able to start to disseminate back to the profession in two events before the 2017 ASA conference – firstly, at the ASA New South Wales branch meeting late in 2016, and earlier in 2017 at the ASA Victoria event (as wrapped up in the Smaller Archives, Technology and Forever blog). At the 2017 ASA conference I was involved in two separate workshops – which I was happy to do as a way of giving back to the community that has helped stretch us as a company. Our first workshop was facilitated by Fraser Faithful (from the Good Shepherd Australia New Zealand) and was almost a re-run of the February workshop, called “Striking a Balance: Archival software workshop for small and medium archives”. I struggled to work out what to bring along, so I packaged up a big slide deck and brought the whole lot along, but I did focus on presenting just a few key parts of that slide deck. And so, I put forward some planning tips for Archival projects, busted a few myths about open source (see our previous Disadvantages of Open Source blog) and also let the attendees know that the community around open source Archival software is growing – and we’re there to help out if they need it. It was also great to hear about the low-level entry software, like FACIT’s Excel spreadsheet and the HDMS system, and it was great to have a practitioner like Jeff Palmer, who is also one of our clients for Archival software support (both AtoM and Archivematica) present on the journey that he’s been on in his institution. The second workshop, called “Towards descriptive synthesis: systems, standards and open source software” and this was held on the last day of the conference. This was a much ‘bigger’ scoped workshop – really asking the question about how does the Archives profession implement the Australian Series System within open source software – and to help move the whole profession towards a ‘standard’ implementation of the Australian Series System. I set up again with another slide deck, and picked components of this again to illustrate some of the more technical aspects. While I focused on the technical side; Lise Summers (SROWA) and Barbara Reed (Recordkeeping Innovation) guided the attendees through the intricacies of the Series System. And, to top that off, we’ve also given each attendee a login to an instance of the latest version of AtoM (which we are hosting here at Gaia Resources) to see what it can do for them. Workshops are great, and all, but what were the outcomes for the people there? Well, from the first one, smaller organisations got more assistance in planning a way forward for the Archives in their organisation, and in the bigger one, we put together a roadmap for how the Archival profession could develop a ‘standard’ way forward. The second one has already stirred up a lot of action from some of the professional members I got to meet (and I’m still trying to keep up with!). From my own perspective, I got a few things out of it – but the most interesting one was just how many institutions were using open source software like AtoM, and how far some of the institutions involved have gone with it – to hear from a small school that they’ve been using it for several years was a great morale booster for me. Why did I need a morale boost? Well, as the saying goes, lies can run around the world before the truth has got its boots on, and the Archives profession – especially around software – is full of unknowns, half-truths and outright fabrications. So a lot of the workshop was about explaining what was going on, and how things were really going, and that was hard work – especially in an era of #fakenews, which – to be honest – I thought Archivists would be more immune to! I spent the two days between the two workshops in the main program streams for the conference, trying to learn as much as I could. The main program at the conference this year didn’t teach me as much as last year – maybe because in between our work with all our clients, and in many discussions with people like Barbara and Lise, had meant that I’ve started to wear a virtual cardigan myself. The theme that emerged was “Archivists as social justice warriors”, and it was something I had seen here and there in the last conference. It was probably spurred on by the topic of choice this year “Diverse Worlds” – and by the two keynote speeches that were given at the start and end of the conference by people who had deliberately disowned the profession; many in between railed at the institutions and the biases, and histories, that exist around the Archives. However, what struck me from the conference was that there was a fair bit of complaining, but not a lot of solutions or suggestions to move forward or make things better. In my mind, providing constructive ways forward would have been a much more useful outcome as an audience member. So, as the conference main program ended with a very powerful keynote about Archives and social justice, I was left with the feeling I didn’t learn a lot about how to move forward (and so, that redoubled my efforts in delivering my final workshop). As I’ve reflected – and indeed, as I wrote this very blog – I have come to realise that this is where my frustration from the conference came from. I felt like I had been sitting around watching a profession talk about itself – something I know all too well from my dealings with the spatial “industry” (and that’s a separate blog!). So let me put my own constructive ways forward on the table. An outline (in conjunction with a core group from the second workshop) about how – as a profession – the Archives can move towards a standard implementation of the Australian Series System. I’ve already been discussing both of these with our colleagues and collaborators at Artefactual (who are the lead developers of AtoM and Archivematica, and due to time zone differences between Perth and Vancouver mean I have 7am video conferences! ), where we’ve been discussing how to support the profession and what services they will need – and how to improve the open source software even more in the future. I’m also doing a few other things – a bunch of specific follow ups with people I’ve met at the conference – but one of the ones I’ll be focusing on shortly is to create a map showing all the Collection and Archive organisations that use open source software in Australia. Stay tuned for that one! Finally, and importantly for us as a business, we’re packaging up some services and solutions for Archive organisations (both big and small), based on what people asked for at the conference. That will mean we’ll have a clear offering for Archives in the very near future, that means that they don’t have to do it alone – and we will be there to help them. It will be interesting to see how far we will have come – and if I start dreaming of electric sheep! – by the time we attend the ASA 2018 conference (“Archives in a Blade Runner Age”), here in Perth next year! By then I might even have my own cardigan… but in the meantime, if you want to talk about Archives, then drop me a line, or start a conversation with us on social media (Facebook, Twitter or LinkedIn). P.S. By the way – GO SEE BLADE RUNNER 2049 IT IS EXCELLENT (although cardigan free).